A naturally occurring uneasy feeling that is created when a person has a large amount of debt at inflated interest rates. This emotionally draining condition is fueled by the belief that that your FICO score defines your self-worth and status in the community. The condition is often marked by paranoia that others will know you have a low FICO score. Symptoms include illogical financial decisions characterized by a dominating desire to maintain your FICO score at any cost. This includes the desire to pay creditors large minimum payment on even-larger balances with outrageous interest rates that you did not agree to pay when borrowing the money; loss of sleep; anxiety; stress; depression; and constant worrying about how to make the minimum payments. The onset of this condition has been linked to the repeated subconscious exposure of the credit industry's subliminal programming that a high FICO score must be maintained at any cost. 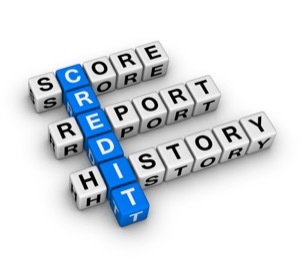 Back in the days before the FICO score, obtaining credit was a matter that was still entrusted to humans. Let's say you went to buy a car. You sat across from a human being who looked at your entire credit report. If you had one or two late payments but mostly on-time payments, they would scratch their chin...hem and haw...but give you credit based on the totality of the credit report, your job stability and other factors that only a human being can make. That was back in the day. In 1989, Fair Issac introduced the first general-purpose FICO score (remember the BEACON score?) for use in the credit industry. Equifax became the first credit reporting agency to use the BEACON score. In 1995, Fannie Mae and Freddie Mac recommended use of the FICO score in evaluating mortgages and from there the FICO score slowly permeated every nook and cranny of the American credit industry. The human analytic method of evaluating credit worthiness was replaced by a computerized statistical analysis of the information on your credit report. Through the years, the FICO score has become God-like in determining whether you receive credit or not and has become more important than any other factor in granting credit. Today's mortgage meltdown is a prime example of ignoring the totality of a person's circumstance (i.e., proof of income, time on job, etc) and granting credit solely on credit score. For approximately five years, from 2000 to 2005, all you needed to get a mortgage was a good FICO score. Your income didn't matter - heck, you didn't even need to prove it. Employment and job stability didn't matter. All that mattered in getting you credit was that three digit number. Credit and mortgage applications were granted by what was stated in an application and in the case of credit card debt - no other verification of income was done if you had the right credit score. Stated mortgages were granted left and right - once again, if you had the right credit score. The credit industry worshiped the FICO score above all else. And we, the American public, bought into the FICO-mania. Yes, the American public was slowly brainwashed by the credit card companies into believing that the all-mighty credit score was a reflection of their individual worth. The threat of a hit on the credit score became something that terrified the average consumer. If any of you have received calls from bill collectors, I will bet that you have been threatened with being reported to the credit bureaus. Everyone today is keenly aware of what their credit score is. They may not remember their anniversary or their mother's birthday -- but you can bet that they know their credit score. This didn't happen by accident though. Are you suffering from FICO-itis? The credit industry has spent billions of dollars convincing us that our credit score should matter to us above all else. To the point where people stress out trying to pay the minimum credit card balances no matter what the credit card companies do. They don't want to ruin their credit score! So the credit card companies change the interest rates in the middle of the game from 8% to 29%, and you get mad, but you still try to pay those outrageous monthly payments so your credit score doesn't get affected. Why? Have you really asked yourself why you are doing that? You didn't incur $10,000 worth of debt at 29% - you borrowed it at 8%. Would you have borrowed it at 29%? I don't think so. So why are you so worried about your credit score and ruining your peace of mind, health, and sanity by trying to pay on terms that you did not originally agree to? If you're doing it for the almighty credit score, you need to pause a minute and really think about whether you've bought into the FICO religion and are worshiping the score, or worse yet, are you identifying your own sense of worth with what that number says? I'm not saying that you should ignore your financial obligations if you are able to meet them. But you shouldn't ignore your health or basic life necessities (mortgage, electricity, food, etc) in order to meet minimum debt payments that don't go down no matter how long you pay on them. If you pay the minimum on credit cards every month, you are treading water. There might be a better way. Living debt free is a much better way to go. If you are mired in credit card debt, there are two main options for getting out of that debt. Credit counseling or bankruptcy. Both options will result in zero debt but the two ways of getting there are completely different on one hand, and exactly the same on the other. How does Credit Counseling differ from bankruptcy? The difference between credit counseling and bankruptcy can be compared to taking a trip from Florida to California (for those of you with less debt, you would be going from Florida to New York!). You can get there by airplane or by driving. If you fly, you pay the airfare and arrive at your destination relatively quickly, rested and ready to go. Nothing more than a little hunger (not even peanuts anymore on those flights) and jet-lag. If you decide to drive, you will still get to California but it will take longer...much longer...and you will pay a lot more money to get there. You have gas, tolls, lodging, food, and unexpected expenses if your car breaks down or something else happens en route. Then add the stress of having to find the money for those unexpected expenses, getting lost (you know it will happen at least once), and don't forget the kids in the backseat fighting. You will eventually reach California but it took more time, cost a lot more and was a little more stressful along the way. True you say, but I won't ruin my credit with a bankruptcy! That's important to me because I want to keep my credit! Good point! Let's take a look at that too. Below is a comparison between credit counseling and a Chapter 7 bankruptcy solution. The credit counseling "points" are taken from the website of one of the major credit consolidation companies in the United States. Pay off Debts within 36 to 60 months Eliminate debts within 4 months in a Chapter 7 bankruptcy. Save your credit score Why? But we will discuss this important myth in more detail below. Does Credit Counseling REALLY help you save your credit score? Let's look at this important selling point for credit counseling agencies. Many people that come to see me tell me that they originally signed up for credit counseling because they wanted to save their credit score from the ten years that a bankruptcy will stay on the credit report. What the credit counseling agency doesn't mention is that while you are in a payment plan with them from 36 to 60 months, your credit score is taking a hit the entire time. So there alone, you have 3 to 5 of the ten years that a bankruptcy will be reported on your credit report. Then, your delinquency status will stay on your credit report for 36 more months until it rolls off and shows current. We are up to anywhere from 6 to 8 years now that your credit score will endure a negative impact as a result of your current situation. By year 8 of a bankruptcy, your credit has made significant strides towards repairing. The only difference is that you did not struggle to pay 50% of what you owe over a 3 to 5 year period. You paid a lot less in legal fees plus court costs. You put that 50% towards your family and your goals yet you still arrive at the same place. Do All Credit Card Companies Agree to Credit Counseling Plans? The short answer is NO. I'm not against credit counseling for those who are really afflicted by FICO-itis and need to go that route for emotional reasons. However, as a Fort Lauderdale bankruptcy attorney, I've had many people sit in my office who went into these payment plans only to find out after paying the counseling agencies thousands of dollars (the monthly payments are not cheap in most cases) that all their credit card companies did not agree to the plan. So out of ten credit cards, only eight are going along with the plan and the other two still want full payment and sometimes even go ahead and sue while you're in a payment plan. Many people have stated that once they sat down to figure out the numbers presented by the counseling agency, they realize that there's no way that the numbers add up to pay the agreed debt in the time line originally told to them. At this point, they make an appointment with a bankruptcy lawyer. When they ask for a refund from the credit counseling agency, they find out that all the money they've paid into the plan is not refundable. It goes to the credit counseling agency in most cases. Have an Advanced Case of FICO-itis?? We'll get you in right away! At the Bankruptcy Law Firm of Clare Casas, I help good people get through these tough times. Call today for a free consultation to see if you have FICO-itis and learn what different treatment options are available to you! The office is located in Davie, just North of Pembroke Pines, Miramar and Hollywood, Florida. It is also conveniently located close to Weston, Plantation, Sunrise, Cooper City, Hallandale and Fort Lauderdale. The entire staff and attorney speak Spanish and you don't even have to miss work since convenient evening and Saturday appointments are available. Call today and take advantage of a free consultation with one of our Fort Lauderdale bankruptcy attorneys to discuss your individual circumstances and how we can help you heal from FICO-itis and begin living debt free sooner than you think! Do you or someone you know have FICO-itis? FICO-itis is curable! Call today!